My life has been absolutely crazy these past few weeks. Back-to-school shopping is one thing, but dance and soccer are kicking up again; AND both of my kids have birthdays in August too. That might not sound like much, but the whole party thing has gotten a wee bit out-of-control this year. My son had a karate party, then I hosted a joint family party for almost 20 people (and I don't just do cake and ice cream like a normal person.) And now I'm gearing up for two more birthday parties for Booking Daughter -- both with tie-dying, tee-shirt altering, and homemade flip flops. So I guess what I'm saying is that I haven't gotten much reading done this month (and it doesn't look like I might get much more done until school starts next week!) 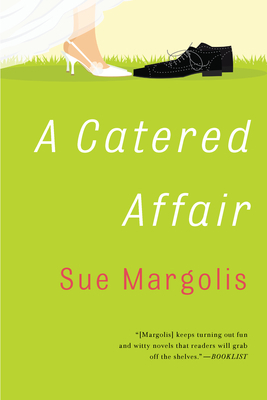 However, I did find time to read a cute book called A CATERED AFFAIR by Sue Margolis. It was a quick, light read that also made me laugh, and it was exactly what I needed. My only regret is that I wasn't able to read it by the swimming pool or beach! I found A CATERED AFFAIR to be a good old-fashioned British Chick Lit book. And years ago, that my was my genre of choice. There is just something about British humor, romance, and a likable main character that have always appealed to my need for escapism reading. I found A CATERED AFFAIR to be extremely funny and I absolutely adored so many of the characters. One of the characters that really made me laugh a lot was Tally's mother. Tally and her mother were extremely different and their tension provided some very funny scenes. Tally was more like her deceased father and she did have some issues with feeling like her mom didn't love her as much as her sister. But despite those problems, I found Tally's mom to be an absolute hoot (and in some ways represented the stereotypical Jewish mom) -- from the way she hounded Tally, to her outspokenness, to her ability to accept Tally's lesbian sister, etc. Of course, her intentions were always good, but I might not have appreciated her quite as much had I been her daughter. I also adored Nana Ida. She was another terrific secondary character and she might have made me laugh even more than Tally's mother. Her wedding ideas were fantastic (and sometimes cringe-worthy!) and I loved her relationship with Tally. She was supportive and wise, and perfectly represented what a grandmother should be -- albeit a zany one! While I did find many of the characters to be very likable, I have to admit that I didn't exactly love Tally for much of the novel. I knew I wanted to love her and I was pretty sure that she was a good person. She just had a few hangups that bothered me -- like her snootiness. None of her flaws were so huge that they affected my enjoyment of the novel, though. And that's one of the reasons that I really appreciated this novel. Tally was forced to examine herself after being dumped at the altar, and she realized some valuable things about herself. She made some huge changes about her expectations of what constitutes an eligible man, and she also learned to see her parents in a new light. I loved how she matured during the story and I even found myself rooting for her happiness! And I'd be remiss if I didn't mention how terrific I think the author is. There is no doubt that Ms. Margolis knows how to write good chick lit! A CATERED AFFAIR is her tenth book, and I just have to wonder what rock I've been living under. I'm pretty sure that I haven't ever read one of her books before, but she will now be one of my go-to sources for light, fun books. Ms. Margolis is just so funny and insightful. Make sure you come back tomorrow because Ms. Margolis will be stopping by with a very cute guest post! If you are looking to read a fun book these last few days of summer, then I recommend giving A CATERED AFFAIR a try! Maybe this is what I need to read, as it sounds like you and I are both in the muck. I seriously have to sit down on a regular basis and do deep breathing. Serious stress. It will get better soon!!! I agree that British chick lit is the best! They just have a way of phrasing things. I hope things slow down for you! This does sound like fun. I bet you're counting the days until school starts. Wow, love the idea of parties with activities! You should have been a party planner! Those Brits have a special way with words, don't they? Hope things cam down for you soon! Aw, this sounds really sweet! I do think I’ll need something lighter in a little bit here. Maybe this is it.